Hannah and Taylor first met in a coffee shop where he noticed that she was an identical twin. Much to her surprise, Taylor was a triplet. It was this brief exchange that sparked a natural curiosity between the two. And, several years later, they were planning a wedding. Hannah was a classic bride on her big day. 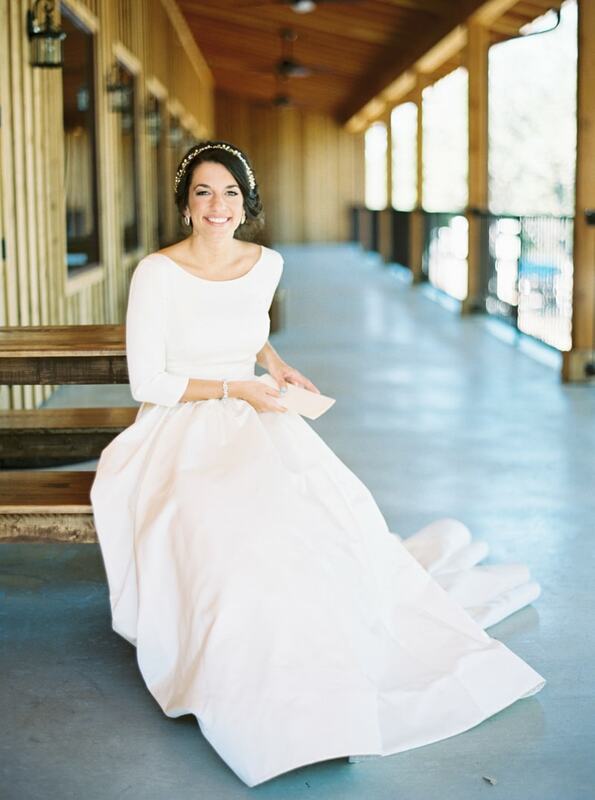 She chose a pair of white heels with ankle straps to walk down the aisle. While her makeup was light and airy, she secured her gorgeous updo with a beaded headband – the perfect accessory for her timeless bateau neck gown. 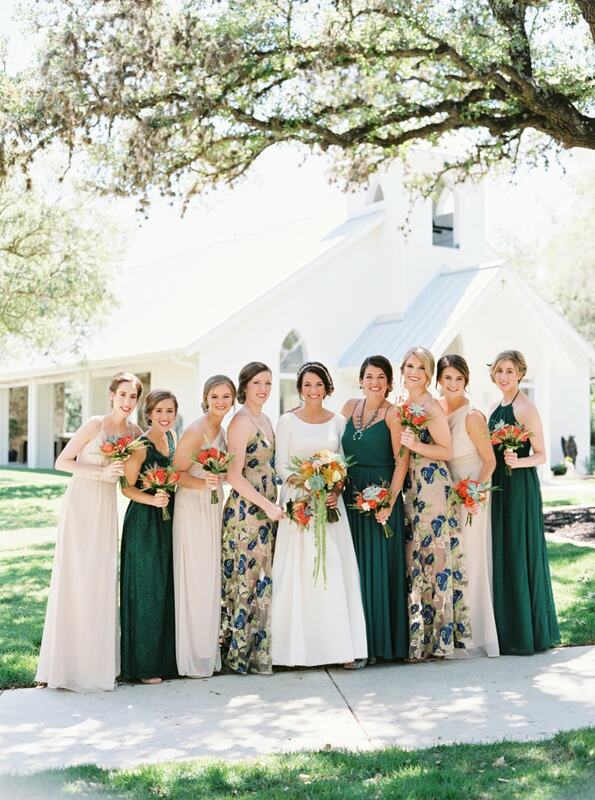 Since Taylor is a musician and Hannah is a painter, every twist and turn of this wedding was lively and stylish. 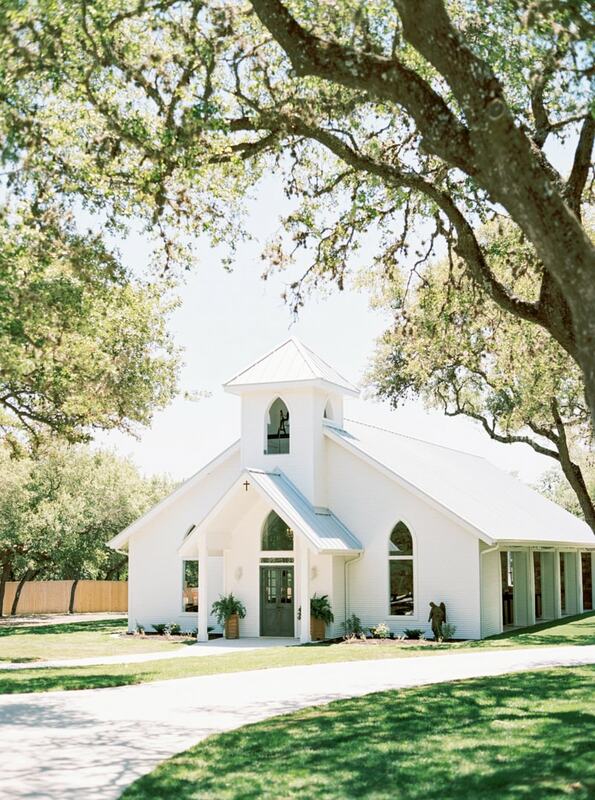 Guests were greeted at the venue by the property’s oak-canopied lane, majestic towering oaks and finally, the enchanting white-washed open-air chapel. Hannah asked her bridesmaids to choose from a collection of complimentary dresses and wear their favorite shoes. Together, they made a radiant group in shades of dark green, off-white and blue. And, their bouquets were exquisitely vivid with coral-colored roses. Hannah looked breathtaking before the ceremony as she posed for photos in her gown. She clutched a fascinating bouquet that teemed with texture and assorted colors that complimented the Texas Hill Country. Taylor’s groomsmen all wore black suits with white shirts. 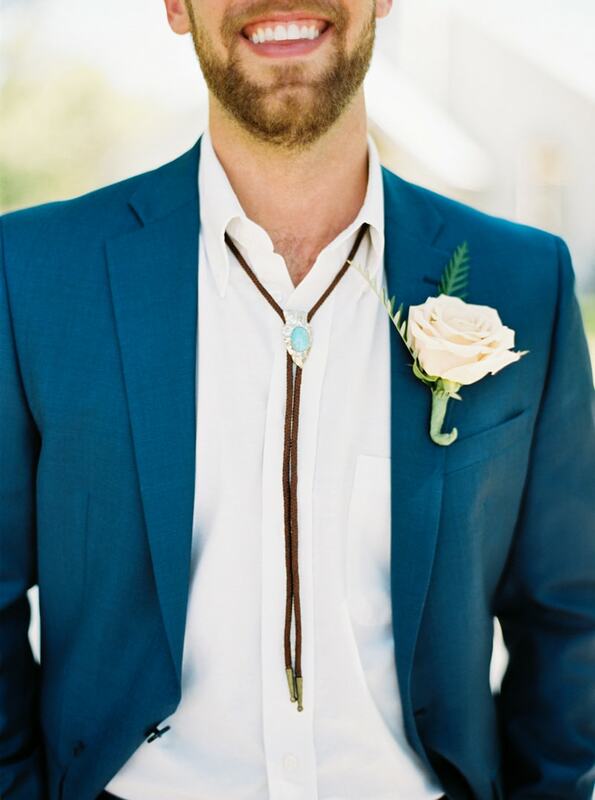 He stood out with a navy blue suit, boho-inspired necktie and plush rose boutonniere. The adorable ring bearer matched him, too! For the ceremony, Hannah wore a cathedral-length veil. With bridesmaids and groomsmen by their sides, and an audience of loved ones, these two made their promises of forever. They sealed their vows with a kiss as the radiant sun shone in through the open window. Outside, Hannah and Taylor couldn’t hide their excitement relishing in their first few moments as husband and wife. But the star of the show had to be Estelle – Hannah’s blue and white vintage Chevy, complete with a custom-made dash crafted by her grandfather. The reception was the epitome of warm and inviting. Outside, guests could mingle and chat amongst rocking chairs and a stone fire pit. 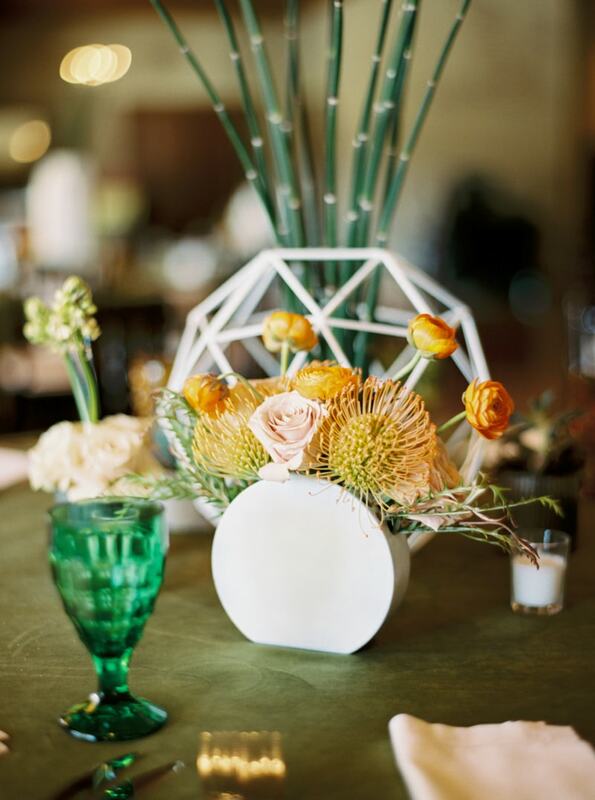 Inside, Hannah decorated the reception tables with vintage radios and centerpieces made from protea and succulents. Black chivari chairs and green table linens made for an exquisite combination as many other tables were decorated with tall centerpieces, vintage green glassware and vibrant florals of all shades. Guests were treated to delicious treats, signature cocktails and a hand-rolled cigar station. Hannah changed into a 1920s-inspired beaded dress before making her getaway with her new husband. Her and Taylor locked hands and hopped in Estelle as a flurry of sparklers showered over them and ignited the night sky. Hannah and Taylor’s wedding day was all about their personalities, from the venue to the exit. They found a way to infuse modern style with classic wedding touches that was subtle, yet impactful and gave this hidden venue in Texas a dose of color and creativity.